We all know that out there are quite a few fantasy romance books that focus on love between two very different kinds of "species". But what you might not know is that more often than not the love between the two types of different species just do not have that same kind of heat that a contempory romance book holds.And it is not often that a fantasy romance book is able to offer me the intensity and flair that I am looking for. 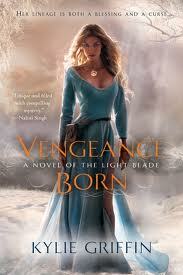 I was very pleasantly surprised with Vengeance Born. Not only did the author transport me to a whole new world she also incorporated the love and passion between Annika and Kalan with such a masterful stroke of the pen that it kept me glued to the edge of my seat till the very end. The mistrust that turns into complete trust between Kalan and Annika and their fights that roll into one powerful and ultimate mission was stunningly penned by the very talented Kylie Griffin and I for one I am expecting many more awesome books from the author. What I really loved about the book was that the author so beautifully captured the feelings of the characters and their different outlooks on life that it felt at one point that I was ready to jump in and help Annika and Kalan ! I highly recommend this one for any lover of reading out there as the book was so much more than just a paranormal/fantasy romance it was a real stunner of a read!